Share "Stop Grubs From Killing Your Lawn"
Grubs are small but mighty pests, causing a lot of lawn damage and frustrating homeowners. Fortunately, there are easy steps to protect lawns and minimize any risk of grub infestations or extensive damage. In addition to the damage grubs themselves can cause, these bugs are a tasty food source for many raccoons, skunks, armadillos and other less welcome backyard guests that will dig up and destroy a lawn as they search for grubs. There are many different grubs that can cause lawn damage. 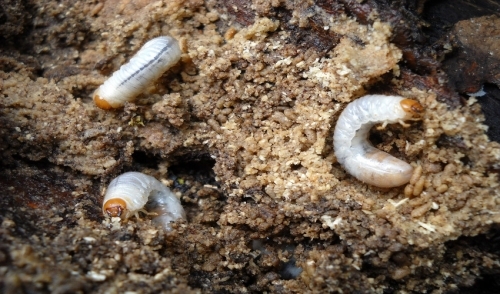 All grubs are the immature larvae form of beetles, and the most common problematic larvae include the offspring of Japanese beetles, masked chafers, June bugs and European chafers. Regardless of which type of grub is causing lawn problems, however, there are steps that can stop the damage. Beetles prefer to lay their eggs in lush, moist lawns, and a drier lawn is less grub-friendly. Consider switching to drought-resistant turf and limiting watering to discourage grub activity. Shaded lawns are also less appealing to grubs. Adult beetles prefer to feed on specific plants, and if you remove those food sources from your landscaping, an infestation of grubs is less likely. Investigate which plants are preferred by beetles in your area, and opt for less tasty food sources. Different insecticide formulas are chemically designed to target specific grubs, and if you properly identify your grub infestation and use the insecticide according to its directions, you can effectively kill off grubs in the lawn and minimize the damage they cause. The fewer adult beetles there are near your lawn, the less likely grub problems will be. While beetle traps can be useful, they attract beetles with pheromones and could increase your grub population inadvertently. Instead, hand-pick adult beetles off landscaping or use adult-formulated insecticide treatments. A damaged lawn is an invitation to more pests and weeds, and reseeding the lawn to repair grub-damaged areas is essential to restore lush, durable turf that will better withstand future infestations, not only of grubs, but of other unwanted residents. Grubs can be a nightmare when they invade an otherwise healthy lawn, but with proper care and perseverance, you can stop grubs from killing your lawn.